You know I love the automotive industry, so I couldn’t say no to the opportunity to work with Florida based-business, Bob’s Auto Sports. Bob’s the man! So, what is Bob’s Auto Sports all about? YOU! Well, really I think your car is first priortiy if I had to guess, based on the quality products they produce, but you are definitely a close second. Bob’s Auto Sports and their team of professionals are niching into custom coating, camera mounts, oil separators, rear axle reservoirs and more! They are doing it right making sure each new product they offer is unique, easy to install and quality made to last the power and time of your muscle machine. Posted by Brooke on February 6, 2014. Leave a comment. In 2012, I was blessed to have won the IBMS (Internationally Bikini Model Search) contest, which landed me as Miss January in their international 2014 bikini calendar. Not only was the experience an exceptional get away to shoot in the Bahamas, but also landed me in connection with a photographer named David Sutton. David and I clicked immediately based on work ethic, artistic style, editing and life in general. We shot almost daily or numerous times a day during golden hours in the Bahamas and created a great collaboration of images during this adventure. Almost a year later, our work was recognized and accepted by a hot upcoming magazine called, Modelz View. Modelz View is unique in their style and acceptance of a variety of talent and model looks. David Sutton contacted me with great news that the material he submitted was not only accepted, but also accepted for a cover feature. I am so proud to announce my Modelz View Cover debut as Miss February – “Brooke – Never had time for a crush” feature. With this feature I want to thank all of my family and friends who continue to stand by me and support my youthful modeling career and understand what an art this industry is to me. Posted by Brooke on February 1, 2014. Leave a comment. I call spending a weekend in Indy with Team Lethal Performance and Jessica Barton for the PRI show…winning! Now, typically PRI (Performance Racing Industry) Show is hosted in the beautiful and warm Orlando, Florida. Lucky for Jessica, I live in Utah and I had plenty of warm clothes for my Team Lethal partner in crime. Jessica and I spent the PRI show interviewing Lethal Performance’s top vendors including: McLeod Racing, The Drive Shaft Shop, Roush, Ford Racing, SCT & more. We learned about the latest and greatest products for mustang and muscle car performance, fuel, traction and tuning. It’s exciting to see all of the technology and advancements taking place in the automotive performance world. One of the big highlights for Ford and mustang fans was the premier of the 2015 Mustang. It was interesting to hear that in images people were somewhat disappointed, while in-person show-goers continued to state it looked better in person. So, the votes were in and it seems the 2015 Mustang pictures do not do it justice! If you missed PRI and any of the awesome inside coverage from Team Lethal’s Jessica Barton and I, check out: www.LethalPerformance.com and show our vendors some love! Happy performance racing to all of you in 2014! Posted by Brooke on December 20, 2013. Leave a comment. I love when I get an opportunity to work next to my nitrous R6! This year Kber 101 and its sister stations put on an event for the guys! Utah welcomed the first debut of “Man Camp” at the Legacy Event Center in Farmington, Utah. Man Camp invited my NOS6 and I (as a local Maxim Model) to hang out and sign posters for event goers. The poster for the show was a limited edition Rat Rod poster featuring Morgan Riders custom Rat Rod. What’s a Man Camp without beautiful women? I was happy to join forces with Black Crown Models, who stole the show with their presence, personalities and poise! Every time I turned my head there were guys snapping pictures of Carly Beth, Kinzey Ray or Sierra Dawn. Oh the joys of the business are simple. 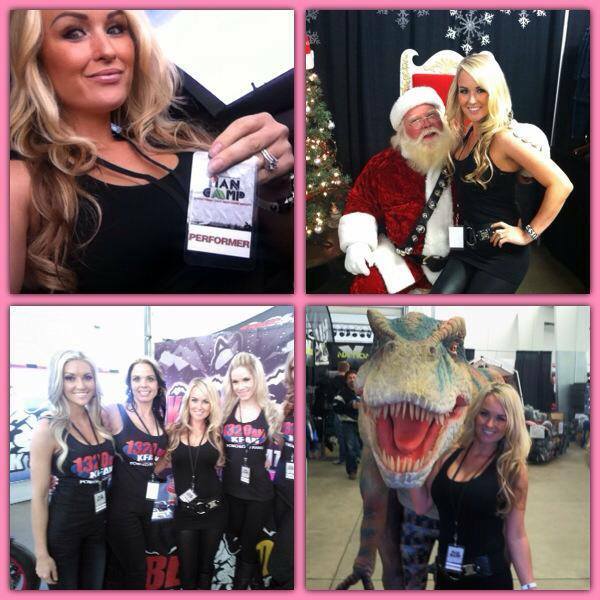 Show highlights include, pictures with T-Rex, Santa Clause and Brooks from the Bachelorette. Thank you to all of the supporters who came to Man Camp 2013. Posted by Brooke on November 30, 2013. Leave a comment.